An enthralling Leg 2 of the Volvo Ocean Race will reach its climax over the next 48 hours with Team Brunel (Bouwe Bekking/NED), Dongfeng Race Team (Charles Caudrelier/FRA) and Abu Dhabi Ocean Racing (Ian Walker/GBR) still scrapping to be the first home. The 5,200 nautical mile (nm) stage has been filled with drama from the starting gun in Cape Town on November 19, when the boats left the South African port in 40 knots of wind with a possible cyclone warning issued just before departure. They skirted the icebergs of the Southern Ocean, dodged a tropical depression and have this week kept clear of the Indian Ocean exclusion zone, which has protected them from a possible piracy attack. One boat, of course, has not reached this point: Team Vestas Wind (Chris Nicholson/AUS) ran into a reef 430nm north-east of Mauritius on November 29, abruptly ending their participation in the leg and several to come, if indeed they can return to this edition. The other six in the fleet have kept racing hard towards Abu Dhabi without major incident, but if the three leaders think they can relax in the final two days before the expected arrivals in Abu Dhabi on Saturday, they should think again with less than 350nm to go. The 41-year-old race has never had a fleet sailing through the Strait of Hormuz before. In 2011, the fleet was shipped through these waters as part of measures against piracy attacks. Before then, the event had never visited this part of the world. This time, however, there is no such respite and the crews will need to keep their wits about them every mile of the way. The Strait is known as one of the world's busiest waterways with a high number of huge tankers sailing back and forth every day: 14 out and 14 in. An exclusion zone - the Traffic Separation Scheme - should keep the fleet clear of the biggest of the transport ships. Furthermore, the winds here are notoriously difficult to predict. The approximate ETA for the leaders is between 2200 UTC on Friday night and 0600 UTC on Saturday morning, according to data. The remaining three boats in the fleet, Team Alvimedica (Charlie Enright/USA), MAPFRE (Iker Martínez/ESP) and Team SCA (Sam Davies/GBR) are due to complete the leg about a day later. 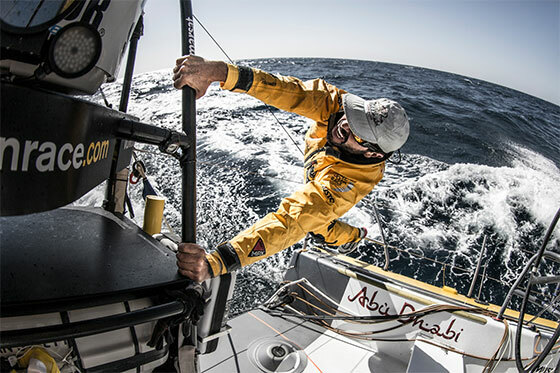 That still gives Abu Dhabi Ocean Racing skipper, Ian Walker, one last throw of the dice to catch leaders Team Brunel and Dongfeng Race Team, 16nm ahead of him. He is hugging the Oman coast to the west in the Arabian Sea and is likely to make swift gains on Thursday, but will then need to head east to catch the likely north-easterly wind, which will help guide the three leaders to the finish over the final 24 hours. Meanwhile, the Abu Dhabi port is preparing for the arrival of the fleet and will officially open the spectacular Race Village there on Friday. "If you're always dreaming about something, you need to work for it. I achieved a lot of things because I had a dream. You're going to get there one day, never give up."